Ready to ride? Don't be a rebel without a cause. Before you hop on your motorcycle, make sure you drive by the rules of the road. While requirements for legally riding a motorcycle vary from state to state, all states share one common requirement: a license to ride. Motorcycle endorsement (on a regular driver's license). Some states require all bikers to obtain a motorcycle permit before securing a full-fledged motorcycle license. Other states offer riders the opportunity to immediately register for a license. Check our state-specific pages on getting a motorcycle license for more on the requirements where you live. Before you put the pedal to the medal on the open road, insure your motorcycle. As with most types of car insurance, you often will have numerous options on how to insure your bike and how much insurance to purchase. Each state holds their own minimum requirements for motorcycle insurance, so be sure you look into this before you buy a policy. You might also inquire about motorcycle insurance discounts. Every motorcyclist needs to register her ride. Titling documents (i.e., the actual title, a bill of sale, etc.). A valid motorcycle permit, endorsement or license. Proof of a passed emissions test, if applicable. Just as some states require drivers to wear seat belts, some states require bikers to wear helmets. Even if your state doesn't have a helmet law, consider wearing a helmet anyway to help make your ride safer. Check your specific state's safety laws pertaining to wearing a motorcycle helmet. Then consider reviewing our page on purchasing a motorcycle helmet that's right for you. Each state maintains a unique set of motorcycle riding requirements. Double check your state's requirements with your local DMV or refer to the motorcycle manual. Once you've mastered the rules of the road, you can hit the highway with your head held high. 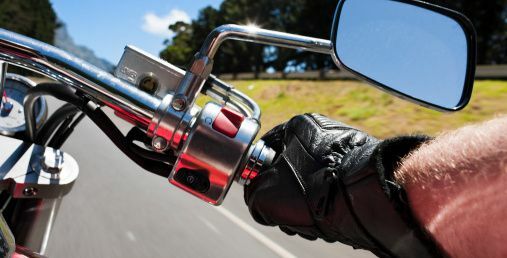 Bikers: What state motorcycling requirement surprised you the most when you got your license? Tell us in the comments section below.